Enables easy roof panel planning and splitting into segments for prefabrication which can then be used in the roof framing process. Panel Layout Planning functions let you better understand how a roof will be divided. Users can control every division line and can predefine rules to automate the division process. Initially an architectural roof can be divided into coarse partitions, or regions. 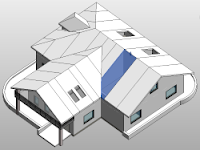 Regions can be created automatically based on ends of roof ridges and bottom ends of valley rafters as well as windows and generic or system openings with predefined distances. Regions can be divided into panels using predefined spacing. Panels can be aligned and modified for an individual roof side or region and additionally split. A variety of automated splitting functions make it easy to get the needed result. Panels can be split in half a variety of ways: by maximum spacing, from the middle to both ends, in the middle and to both ends, from the initially selected end, or from both ends. Selected regions or panels can be joined, if needed. Creates individual panels for the selected roof side or for the whole roof. The full roof panels can later be taken to a new phase via their properties for better filtering and scheduling. Automates wood framing work with prefabricated roofs in Revit® projects. Powerful, flexible, and easy to use. It helps you make optimal choices, move much faster, and avoid errors at every BIM stage – from design and documentation to roof segment fabrication and construction. Create detailed, multilayer, prefabricated timber roof framing for your Revit model in a snap using fully customizable rules and templates. 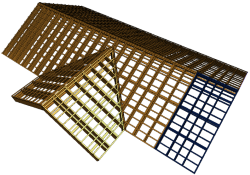 Frame large roofs with identical panels 10 times faster than using the standard Revit interface. Control joists, rim joists, nogging, bridging, blocking, and bracing placement. Configure openings, details, service hole positions, and more. Auto-distribute battens, secondary frame and roofing. Roof frames and shop drawings update and adapt according to any changes. Perform structural analysis without leaving Revit, and export your wood frames to external analysis software at any stage of the design process. 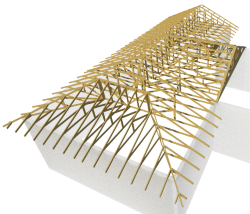 Automates wood framing work with rafter roofs in Revit® projects. Powerful, flexible, and easy to use. It helps you make optimal choices, move much faster, and avoid errors at every BIM stage – from design and documentation to fabrication and construction. 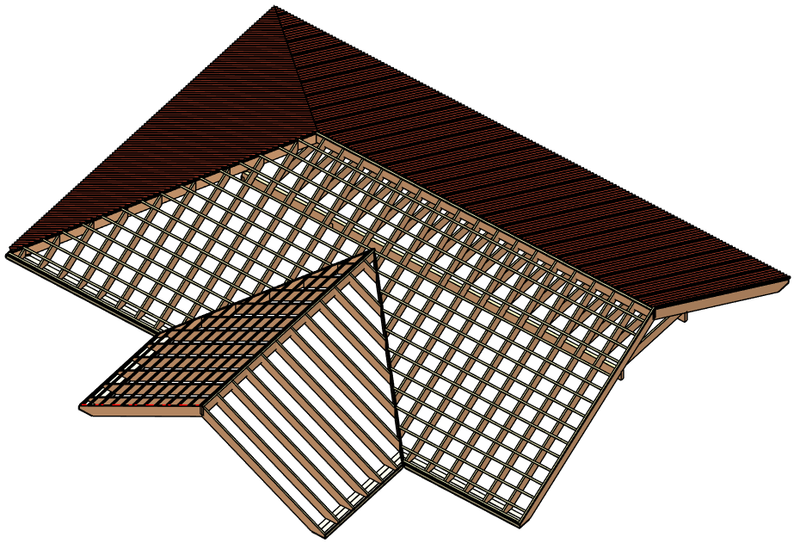 Create detailed, multi-layer, timber rafter roof framing in a snap for your Revit model using fully customizable rules and templates. Frame an entire roof based on its 3D model including hip/valley rafters, ridges, girders, collars, battens, horizontal beams, sleepers, trimmers, etc. Auto-detect and frame roof openings, and cope ends of existing beams. Freely revise your Revit model by easily selecting the elements and properties you want to modify. One-click generation of shop drawings and cut lists. Get real-time take-offs and views, plus automatic sorting and dimensioning. Perform structural analysis without leaving Revit or export your wood frames to external analysis software at any stage of the design process. Gives Revit® users a single robust platform to generate wood truss systems instantly, perform structural analysis, and auto-generate shop drawings tailored to your standards. Functions are versatile, parameters easy to control, and changes occur in real time. Build full truss systems in one go with the configurable 3D grid (escaping the limited and time-consuming nature of standard Revit truss family insertion). Easily assess options – such as wooden truss framing – in economic, structural, and systemic terms, to make the best design decisions. Create new parametric, uniquely-shaped truss families based on model lines and roofs for immediate use in your projects. Freely revise your Revit model, updating and adapting truss systems as needed. Get real-time take-offs and views, automatic creation of shop drawings and cut lists, and easy export to CNC machines. Creates openings with fire safety components throughout a Revit® model where ducts, pipes, cable trays, and conduits intersect with walls, floors, roofs, ceilings, beams, and columns. Cut Opening creates openings with special holding details for structural beams. Automatically creates openings where ducts, pipes, cable trays, or conduits intersect walls, floors, roofs, ceilings, beams, or columns. Automatically adds openings with predefined sizes in accordance with MEP line-based element sizes, categories, and system classifications. Automatically joins openings with predefined configurations. Automatically inserts Fire Dampers where ducts clash with walls, floors, ceilings, or roofs with fire rating. Automatically inserts structural openings for separate architectural and structural models. Enhances BIM-team work and deliverables for integrated project delivery (IPD). Renumber Revit® elements just the way you want, detect and renumber grids, determine swing direction and orientation (and add them as properties), recalculate shared coordinates, and much more. Detects and renumbers grid geometry. Renumbers grids automatically after they have been changed in the project. Powerful and flexible functions allow renumbering of any Revit elements (Doors, Windows, Beams, Columns, Pipes, etc.) in a number of different ways. Writes swing direction for doors into the door's properties. Writes flip/mirror orientation for the selected elements. Recalculates shared X, Y, Z coordinates. Creates new shared parameters and many more functions. Possibility of saving numbering settings under a separate name. Possibility of sorting elements in ascending/descending order. Would you like a quote or a live demo from our experts? CONTACT US! Support during the trial period. CWC (Canadian Wood Council) Wood Design Manual including CSA O86 Standard and CWC Commentary on CSA O86 (2010). National Design Specification® (NDS®) for Wood Construction (NDS 2015). American Forest and Paper Association (AF&PA). American Wood Council, Washington DC, 2015. The Encyclopedia of Trusses. Alpine Engineered Products, Inc., 2003. Truss Design Procedures and Specifications for Light Metal Plate Connected Wood Trusses / TPIC – 2014. Truss Plate Institute of Canada (TPIC), 2014. Using Narrow Pieces of Wood Structural Panel Sheathing in Wood Shear Walls. American Plywood Association (APA), The Engineered Wood Association, Tacoma, Washington, 2005. Wood Framing Roof is brought to you by AGACAD. Pricing was not known at press time.